I can still feel the sharp edges of the very first Lego brick I stood on. I’m reminded of it, 35-plus years later, each time I step on the Lego bricks of my children. After all, Lego has remained popular throughout my life. What’s more, I’m a bit obsessed by certain aspects of Lego. I love the building, and applying labels to the bricks… I’ve also bought and sold a bit of Lego over the years, with reasonably good results 9 Tips for Making the Most Money When Selling Old Toys 9 Tips for Making the Most Money When Selling Old Toys Old toys can be worth a lot of money... if you know how to sell them. These tips will help you get the most out of your sales. Read More . But beyond a Lego train set, one thing I’ve never done is build a remote-control Lego robot. If anything, I’ve found these kits to be a bit intimidating. I shouldn’t have worried; as I recently found out, the new Lego Mindstorms EV3 robot is a pleasure to build and program. This is a big kit. In the box, you’ll find a lot of Lego pieces, from Technic-style arms and axles, to clamps, and pieces that look like they wouldn’t be out of place on an aircraft model. There’s also caterpillar tracks and compatible wheels. You’ll also find the Programmable EV3 Brick (more on that below), various wires and cables, motors, and optical sensors. Presumably to save on paper, the Lego Mindstorms 31313 includes instructions for just one of the five builds; the other build instructions can be found online. What we get in the box, however, is certainly good enough to get started. The Track3r is a tank-like robot that wields a weapon and can find its way around a pre-printed map (the unwrapped outer sleeve of the box). Build time is about an hour, depending on how you organize your bricks. Alternatives to this are the Spik3r (a sort of robot scorpion), R3ptor (a snake-like creature) and Gripp3r. There’s also the main build, the giant Ev3rstorm robot that graces the front of the box. At the heart of each of these builds is the famous Programmable EV3 Brick, a large control center that features several Lego Technic connectors for easy integration. As ever when building using Lego, it’s a good idea to sort your pieces out in advance, preferably into color-matched groups. Without this brick, a Mindstorms kit would just be a pretentiously named Lego Technic set. It is via the EV3 Brick that we’re able to instruct the chosen Mindstorms build to move, and to program further routines. As a control center and power-station — six AA batteries are required — the EV3 Brick features four input ports (labelled 1, 2, 3, 4) to connect sensors. A further four output ports (labeled A-D) connect the brick to the motors. Meanwhile, there is direct compatibility with Windows and Mac OS X via a mini USB PC port. A USB host port is also available for connecting a Wi-Fi dongle; you may also wish to daisy chain other EV3 bricks. If memory expansion is required for the EV3 Brick, a micro-SD card slot is also included. The EV3 Brick isn’t the only bulky component of this Lego Mindstorms kit. There’s an IR sensor (for the remote control), a color sensor (recognises seven colors and measures light intensity), and a touch sensor (recognizes three conditions: touch, bumped, released). Also included is a medium servo motor, and two large motors. Each of these can be incorporated in various ways. For instance, the servo motor drives a spinning arm on the Track3r build. There’s also an IR beacon remote control, which we’ll look at below. It’s the color sensor that is used with the unwrapped outer sleeve of the box. As mentioned above, it is here that you’ll find a pre-printed “road”, designed for the sensor to guide your Mindstorms project along. Without the motors and the EV3 Brick, this is nothing more than a futuristic Lego Technic kit. The programmable computer, servo, and motors enhance the bricks. But to what end? Lego Mindstorms: Who Is It For? Lego kits always include a notice on the box advising the buyer of the perfect age range. With Lego Mindstorms 31313, this number is 10+. Now, I know plenty of adults that would find this kit challenging. Similarly, I know one or two young people under 10 that would absolutely adore it. But, it’s certainly not for 5 year olds (unlike, say, Tinkerbots Learning Robotics for Kids: Tinkerbots Review Learning Robotics for Kids: Tinkerbots Review Want to get your children interested in robotics?Then perhaps you should take a look at the Tinkerbots Advanced Builder Set, a $250 plastic brick-building kit with motorized components and a programmable brain. Read More ). I’d suggest that 8 is a good lower-age range for this kit. However, unless the child you’re buying something like this for is a prodigy, they’re probably not going to fully appreciate it until they’re in secondary education. If you’re planning to buy one of these kits as a present, keep in mind that the motors, sensors and EV3 make it pretty expensive. In the USA, this is $350, while in the UK you’ll find it for around £220. Meanwhile, once a build is complete, you’ll be able to have a play with it, after programming the EV3 block (see below). You’ll also find that each build has some variations that can be enjoyed as “missions”. Some of these tasks might include the printed road, found in the box’s sleeve. You have several options for programming the EV3 Programmable Block. The first is pretty low-level, but you’ll find it useful to see how the block works. Basically, it comes with various pre-installed routines that you will find by navigating through the EV3’s menu. Progamming is really the second string for the Lego Mindstorms 31313 kit. Once you’ve got your build completed — the instruction guides are as clear as you would expect, and can be found online — learning to program the EV3 brick is the next challenge. After sampling the built-in routines, two programming options are available. There’s a desktop app for Windows and Mac called the EV3 Programming Software, and a mobile app for iOS and Android called Lego Mindstorms Programmer. With a USB-to-PC cable and microSD slot for programing via the desktop, the EV3 is perhaps more easily programmed via mobile. The mobile app also includes instructions for alternate builds (the packaged guidebook features just one), and the programming tool takes a block-based, drag-and-drop approach to creating routines and making your robot move. It’s simple, straightforward, and effortless. 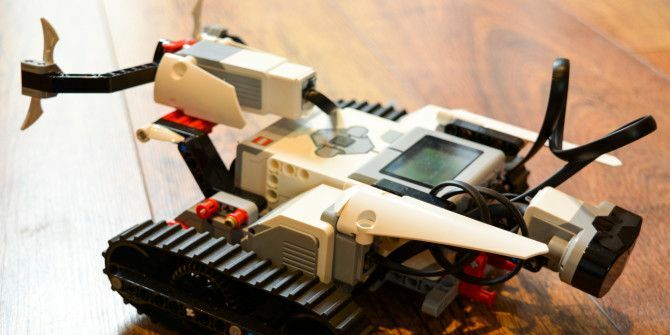 As long as you’ve established a Bluetooth connection to the EV3 brick, your programmed course will be beamed to the Lego robot and obeyed. As you should have guessed by now, I have good experience with Lego. I’ve never held an exhibition of my builds, but I know how to start, how to keep going, and how to finish. Understanding this is key to your success with any of these types of kit. Whether you’re building the Track3r, Ev3rstorm robot, or whatever, you’ll find that you have several options available for controlling your build remotely. The most obvious option is the IR Beacon, a small remote control device that allows you to control the direction of the build. Buttons on either side of the multi-channel device enable independent tread control, too. You can change channels by pushing the red switch through its various positions, resulting in extra actions. For instance, with the Track3r, setting the switch to the central position will enable you to spin the weapon. For the IR Beacon to work, however, it must be accompanied on the robot by the IR sensor. For an additional (and, to be honest, superior) control option, you should seek out the Lego Mindstorms Commander app for iOS and Android. Requiring a Bluetooth connection (your EV3 block will need to be switched on, and Bluetooth enabled via the Settings menu), you’ll gain far superior control to the treads and the currently armed weapon than is possible with the IR Beacon. The movement of the treads can be far more delicately controlled. Need to drive your Mindstorms EV3 creation carefully? Use the app to slow things down, simply by dragging your thumbs up and down a representation of the treads on your display. It’s intuitive, and it’s worth using. Like almost all Lego, the Mindstorms EV3 kit will appeal to all ages. Straightforward to build and program, fun to use and learn with, this is the ultimate robotics gift for young engineers. Explore more about: LEGO, MakeUseOf Giveaway, Toys.